The song “(We’re Gonna) Rock Around the Clock” by Bill Haley and His Comets has us looking at the roots of rock and roll. This song was written by Max C. Freedman and James E. Myers (as Jimmy DeKnight) and was first recorded by Sonny Dae and His Knights. Bill Haley and His Comets recorded and released it in 1954. 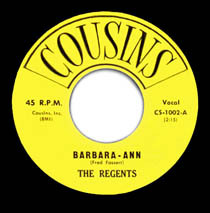 Although their version made it to the pop charts, it was initially considered to be a commercial disappointment. Then, in 1955, when Glenn Ford was helping producers of the film Blackboard Jungle find a song to represent 1955 youth, he borrowed his son Peter’s record collection. The producers loved the song and used it in the opening credits. When the movie was released, “Rock Around The Clock” took off, skyrocketing to #1 on the U.S. Billboard Pop Chart and #1 on the U.K. Chart, selling millions of copies worldwide. Since many people at the time did not know what rock and roll was, the label on the single calls it a “Fox Trot.” The song was also used as the opening theme for the TV show Happy Days. 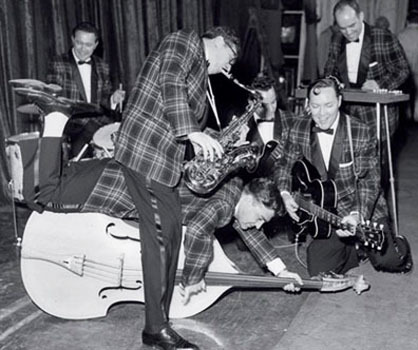 Another hit by Bill Haley and His Comets was “See You Later Alligator.” Please click here to read more about it and listen to it. Please click here for the Daily Doo Wop YouTube channel, to which you can subscribe. Thank you for stopping by The Daily Doo Wop. Hope you enjoyed “”(We’re Gonna) Rock Around the Clock” by Bill Haley and His Comets. Great. Dig that curly cue. Love those early rock and roll hits.